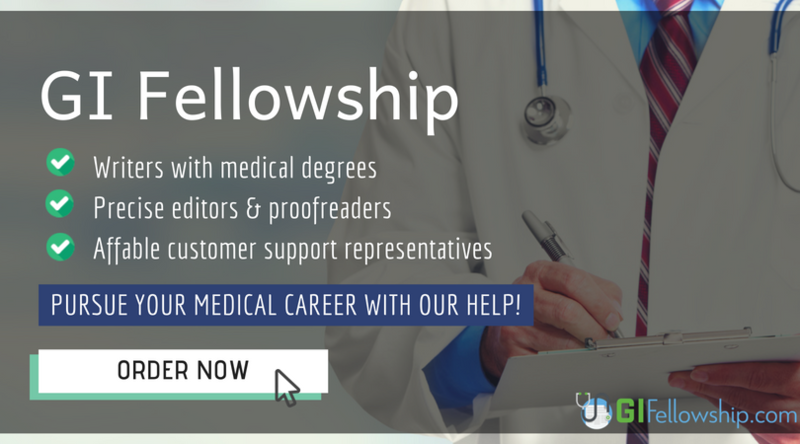 Do You Need Help with Your Gastroenterology Fellowship Application? No matter what your specialty area your GI application is going to go through the ERAS system. This is where you will upload all of your documentation and make your selections as to which programs you wish to apply to. Of course, you are not going to be alone and many others will be applying to the same programs as you. Your competition will be equally as well qualified as you are with equally as impressive experience. So how you present yourself through your application will have a huge impact on your chances of success. Our order form is available on our website around the clock and is very simple to complete. Just provide us with the few pieces of information that we ask you for and let us know just how quickly you would like your support delivered. All of the information that you provide is always covered by our confidentiality policy and not shared with any other party. All of our offered services are highly affordable and competitively priced when compared to other services that offer a similar level of quality. Payments are made through well-known methods that use very secure channels at all times. Again your information is totally secure. Your payment is fully protected by our full satisfaction money back guarantee should you not be happy with the help that we provide. Making a GI application is not something that just anyone can help with. This is why your consultant will not just be a skilled writer; they will also hold a relevant postgraduate degree and fully understand what the committee will be looking for. Once assigned your writer will know all the information that is required to write an effective gastroenterology fellowship personal statement. All work provided through our services is done from first principles in conjunction with you to ensure that it is personal, unique and tailored to the application that you are making. It is initially considered a draft and you should review it carefully to ensure that it is exactly what you want to submit. We will help you with unlimited revisions and our experts work with you to improve your documents until you are fully satisfied with all of the results. After the draft is finished to your requirements it will be passed on for plagiarism testing and final proofreading. We only ever provide work that is totally unique and free of all forms of errors. It will be formatted to the requirements of your application and then delivered to you within the agreed deadline. If you feel that you need help with any aspect of your gastroenterology fellowship application simply contact our specialists here today for effective and affordable support!